In the brightly colored basement of an old fraternity house in Bloomington, Indiana, an eclectic group of customers gather daily over coffee. Proudly home to kitschy 1970s furniture and vintage wall hangings depicting Neil Armstrong, JFK and dogs playing poker, the independent coffeehouse Soma serves up lattes, mochas, macchiatos and regular cups of joe. "In the morning, we normally have a crowd of middle-aged professionals who hang out here and get coffee before they head to work, and in the afternoon groups of punk rock kids come here on their bikes," says Abe Morris, a former manager of Soma who has recently cut back on his hours to make time for graduate school. "On weekends, a retired couple often drops by to meet with their grown-up kids, and they all have family time," he says. The coffee offered at Soma is as diverse as its customers, and in addition to flavored varieties, includes colorful packets of certified "shade grown" (i.e., "songbird friendly"), "organic" and "Fair Trade" java. Down the street in this college town, the Theater Café serves only organic coffee and blends at prices that guarantee farmers a living wage. Clearly, many consumers—even cash-strapped college students—are willing to pay extra for a dose of political correctness along with their morning jolt. To most casual browsers, coffee has as much to do with songbirds as chalk does to cheese, but a growing movement centering on coffee’s many political dimensions is beginning, like the caffeine in the cup, to wake up a disinterested public. According to 2005 data from the National Coffee Association (NCA), 80 percent of Americans drink coffee occasionally, while 53 percent drink it daily. America’s 236 million coffee consumers spent an estimated $19 billion on the beverage in 2004, or $80.50 per person. Coffee accounts for 91 percent of the U.S. hot drink market by volume and 76 percent by value, according to the market research firm Euromonitor International. 400 in 1997 and 1,400 in 1987. Globally, more than 500 billion cups of coffee are made each year, making the steamy beverage a commodity second only to oil in terms of dollars traded worldwide. About 58 percent of coffee is consumed in Europe, the United States and Japan, although 25 percent is poured in the countries in which the beans are grown, according to the International Coffee Organization. The fastest growth in consumption is occurring in the Asian and Pacific region and in Central and Eastern Europe. Although the U.S. buys the most coffee by volume, per-capita consumption is actually highest in the Nordic countries, where Finns, for example, partake of more than four cups a day on average. Coffee is a tropical plant that is grown in some 50 countries around the world on some 30 million acres. Although a small amount of coffee has been farmed in Hawaii since the days of the islands" storied monarchy, and a fairly robust industry exists in Puerto Rico, most of the beverage hails from developing nations. In fact, coffee is the principal commercial crop of over a dozen countries, half of which earn 25 to 50 percent of their foreign cash from its export. Unfortunately for the world’s java growers, less than 10 percent of the commodity’s $60 billion annual value makes its way into the hands of the farmers, reports Ontario-based Equator Coffee Roasters. As Gregory Dicum and Nina Luttinger write in their 1999 tome The Coffee Book, "The experience of enjoying a leisurely cup of fragrant java over a Sunday morning newspaper seems to belong in a different universe from the experience of picking your ten-thousandth red coffee cherry [actually, a pair of seeds], throwing it into a heavy sack with the rest as the tropical sun beats down on your back and you wheeze with pesticide-scarred lungs. Yet, they’re part of the same product." In fact, the average consumer is scarcely aware that coffee is the root of widespread deforestation, loss of biodiversity, pollution and social ills—or that it also has the potential to reverse these problems. A much-told legend asserts that, more than 1,000 years ago in the Arabian Peninsula, a goat herder named Kaldi found his goats dancing joyously around a green-leafed shrub. Kaldi discovered that the plant’s bright red cherries were the source of the animals" excitement, and he tried them for himself. Soon afterwards, monks at a nearby monastery began using the plant to stay awake during long nights of pious prayer. Word got around to other monasteries, and so began mankind’s love affair with coffee. The story is probably apocryphal, since botanical evidence suggests that the coffee plant (Coffea arabica) originated in the highlands of central Ethiopia. At first, the cherries were simply chewed, but eventually someone tried roasting the beans over a fire and then brewing them with boiling water. By the 1400s, Sufi Muslims began using coffee in their mystical rituals. In fact, many writers have theorized that the global coffee craze might never have caught on had it not been for Islam’s prohibition of alcohol, which led Muslims to turn to something else that was both psychoactive and a social glue. As The Economist wrote, "Coffee came to be regarded as the very antithesis of alcoholic drinks, sobering rather than intoxicating, stimulating mental activity and heightening perception rather than dulling the senses." In his 2005 book Coffee: A Dark History, Antony Wild argues that the coffee trade was an important spoke in the great wheel that was the Ottoman Empire, whose leaders went to great pains to protect their monopoly on the commodity. Coffee houses fanned out across the Middle East, and started appearing in Europe around 1650. Wild argues that the Enlightenment might never have occurred, or at best would not have been near as luminous, had such visionaries as Isaac Newton and Voltaire (who is reputed to have swallowed 50 to 72 cups a day) not been java junkies. In the 17th century, after some Dutch entrepreneurs smashed the Ottoman cartel by smuggling coffee seedlings out of the Middle East and onto Java (hence the colorful synonym), Europe’s seafaring powers began sowing their colonies with the crop. It turned out that coffee grew very well in Haiti (controlled by the French), Brazil (Portuguese), Ceylon (British) and other parts of the tropics. The Europeans brutally mobilized legions of slaves and low-paid workers to cultivate the labor-intensive crop, which requires trimming and weeding, as well as hand picking the cherries. Even where independent farmers could work their own coffee plots, it was the colonial traders and rulers who earned the grande profits. lutionary War, coffee started coming into fashion in the American colonies as a replacement not for alcohol but tea, which was famously taxed by the British monarchy. Perhaps it’s not surprising for a nation that renamed towns and streets (as well as frankfurters) from the German during World War II, shunned many things Russian during the Cold War, and most recently politicized French fries by turning them into "Freedom Fries" that the popularity of this suddenly patriotic drink started taking off after the Boston Tea Party. "Coffee grows best in tropical highlands," explains Chris Wille, the Costa Rica-based chief of the Rainforest Alliance’s Sustainable Agriculture Program. The bushy plants are maintained at a height of six to eight feet. After the seeds are dried and hulled, they become green coffee beans. A mature coffee plant generally yields about a pound of roasted beans per year. According to Connecticut-based roaster Coffee-Tea-Etc., "Every step in the process from climate and growing conditions, genetics of the tree, to the final brewing methods affect these natural chemicals. Each of these factors affects the distinct taste of the final brew." Diego Llach, whose family has farmed coffee on the rugged slopes of El Salvador’s volcanoes for four generations, says at first glance his farm is barely discernible from the surrounding rainforest. "We try to mimic the rainforest as much as possible," explains Llach. "We have a canopy of tall shade trees, and below that a canopy of medium shade trees, then the coffee plants, and below that wheat, which provides food for beneficial insects. This biological chain creates a balance of thriving plants and animals." Llach says visitors to his lush farm can expect to see butterflies darting among the foliage, grasshoppers and many other insects, a family of raccoons that lives in the area and a variety of birds, from toucans to warblers. However, many modern coffee farms are not nearly as idyllic as Llach"s. About 30 years ago, riding the tide of the global Green Revolution, many coffee farmers around the world began converting from traditional ways to what’s widely known as "technified" or "full-sun" production, which provides improved short-term yields of around 30 percent. "Farmers started taking out all the vegetation and planting rows of coffee that stretch to the horizon like cornfields in Iowa," explains Greg Butcher, director of bird conservation for the National Audubon Society. Unfortunately, ecologists now realize that full-sun production has serious consequences for the environment and human health. "These are monocultures that have almost no biodiversity value whatsoever," explains Butcher, who has a Ph.D. in zoology. "The farmers go out of their way to kill all other forms of organisms in these fields, including competing plants and insects. You"ll see almost nothing living there except the coffee plants." 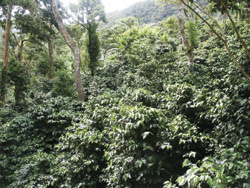 This concerns scientists, because as Wille explains, "The mountain forests that coffee grows well in are also fragile and host some of the world’s highest biodiversity." In environmental circles, habitat loss is often cited as one of the biggest threats to the planet’s wildlife, and coffee production has certainly engulfed its share. Over the centuries, the colonial powers cleared millions of acres of virgin tropical forests to make room for coffee, and millions more were degraded by erosion, damage to waterways and other secondary effects of production. "In heavily deforested Haiti, about 80 percent of the loss of tree cover came from coffee production," explains Llach. Today, an estimated one million acres of tropical forest disappear each year in Central America from human activities, as does a similar amount in Mexico, according to the activist group Global Exchange. Equator Coffee Roasters reports that technified coffee production has been the second leading cause of rainforest destruction in recent years. Wille estimates that about half of the seven million acres of coffee now grown in northern and central Latin America has been converted to full-sun methods. According to a Smithsonian Migratory Bird Center analysis of coffee farms, 17 percent of Mexico’s acreage is now monoculture, as is 40 percent of Costa Rica’s and 69 percent of Colombia"s. Huge fields of full-sun coffee now dominate the landscape in Vietnam, Brazil and Indonesia, and the variety makes up about 75 percent of the coffee consumed in North America, according to Equator Roasters. Traditionally, coffee was grown the way Llach does it, in the shade of tropical trees. "Shade coffee farms are bursting with life, and if you visit one you will see orange and lime trees, bananas, and many other types of plants with the coffee," explains Guatemala-based Jeronimo Bollen, the founder and president of the farmer-support organization Manos Campesinos. The shading trees often yield fruit, avocados and wood that can help farmers feed their families and earn extra income, and the forest floor is often planted with vegetables and herbs. "We’ve planted 90,000 trees in the last five years, 75 percent of which are native, and many of those are in danger of extinction," says Llach. "Now that we don’t use chemicals anymore we have weeds, but they are good weeds that help us maintain soil humidity and structure," Llach adds. "Before, we used to get a plague of a certain pest because it had no biological controls, but now, each species controls itself." The Audubon Society reports that a shade coffee farm may have more than 100 species of plants, and one study counted 793 species of insects and spiders on a single farm. In 1980, scientists in Guatemala discovered that the forest canopy of shade-grown coffee farms could support biodiversity that approximates natural forests, in stark contrast to agribusiness-driven monocultures. Monkeys, bats, coatimundis, agoutis, wild boar, ocelots, anteaters, salamanders, vines, orchids and other epiphytes are some of the living things that frequent and flourish on shade-grown coffee farms, which some experts call "agroforests." In recent years, however, much of the scientific community’s interest has focused on the feathered denizens of the farms. "Of course, nothing beats a pristine forest in terms of habitat, but it turns out that shade-grown coffee is unusually good at supporting birds," explains Audubon’s Butcher. "In eastern Chiapas, Mexico, Smithsonian Migratory Bird Center biologists found that traditionally managed coffee and cacao (chocolate) plantations support over 150 species of birds; a greater number than is found in other agricultural habitats, and exceeded only in undisturbed tropical forest," reports the center. Studies have also shown that full-sun farms have 95 percent fewer species of birds than shade operations, and that fewer than 10 percent of the 150 species of North American songbirds that winter in Latin America can survive a season on a full-sun plantation. warm months, eating enormous amounts of pest insects. Unlike many environmental issues, which often seem hopelessly complex, painfully slow acting or geographically remote, the birds people watch out their windows as they sip their morning French roast have a clear, direct connection to what’s in their cups. Many scientists have sounded the alarm that the populations of these migratory birds have plummeted 50 percent in the last 25 years. Numbers have declined 70 percent in the case of the Tennessee warbler, 50 percent for the Cape May warbler and 30 percent for the Baltimore oriole, for example. However, U.S. Forest Service scientist Joe Wunderle argues that many birds have probably been saved from extinction specifically because they have found suitable living space on shade-grown coffee farms. Butcher points out the example of the golden-cheeked warbler, an endangered bird that nests only in central Texas and migrates in the winter to southern Mexico, Guatemala and Honduras. "The golden-cheeked warbler is just holding on," says Butcher. "There’s been a lot of intensive land use in both parts of its range, including suburban development in Texas, and deforestation is a major threat to its tropical homes." Butcher believes the bird has found invaluable habitat on shade-grown coffee farms. Another bird that benefits from the same habitat is the threatened cerulean warbler, which is thought to use shade farms as migratory stopover sites and as prime living space. Other migratory birds known to frequent traditional coffee farms include the ovenbird, wood thrush, Baltimore oriole, ruby-throated and buff-bellied hummingbirds, swallow-tailed kite, Kentucky warbler, hermit warbler, painted bunting, greater pewee, chuck-will"s-widow and short-tailed hawk. Of course, year-round residents also make their homes among the bright red coffee cherries, including jays, wood creepers, hummingbirds, toucans, parrots, parakeets and other species. "Any bird that makes use of the tree canopy can do fine in shade-grown farms, so which birds will live where is a matter of the elevations at which the birds normally live," explains Butcher. Even so, the coffee farms may not provide much suitable habitat for birds that spend most of their time in the understory. "At the extreme end, these plantations are very natural canopies, but the more thinned out they are, the less valuable they are for birds," adds Butcher. Rainforest Alliance also cautions that some higher-yield shade coffees are now being grown with only a few species of trees, making them less valuable for biodiversity. In El Salvador, where only seven percent of the original forest cover remains, about 95 percent of the coffee crop is still tended under shade cover. According to Rainforest Alliance, this acreage forms vital corridors that link up with the country’s fragmented patches of virgin forest and reserves, greatly expanding the available habitat. "The shade coffee farmers in the Sierra Madre Mountains of southwest Chiapas, Mexico also help maintain an important buffer zone around the El Triunfo Biosphere Reserve," adds Julian Teixeira, communications manager for Conservation International’s Center for Environmental Leadership in Business. The acclaimed reserve is home to one of the world’s largest cloud forests and is a major ecotourism site. Another problem with sun coffee plantations is that, without the protective tree cover, the notoriously thin tropical soils are heavily exposed to the torrential rains and blinding sunlight that characterize that part of the world. Erosion and damage to the communities of microorganisms that form the vital living structure of soil is therefore a serious concern, as is worsened flooding. "With technified production, you have to replace your coffee plants every six to eight years, but with organic and shade methods you can have your plants up to 20 years. This saves farmers money and labor," says Bollen of Manos Campesinos. Since full-sun plantations lack the natural fertilizer and pest control provided by the surrounding environment, they require heavy loads of chemical pesticides and fertilizers. While research suggests that these chemicals may be burned off the final product during the roasting process, and therefore pose little risk to consumers, they can have a huge effect on the environment and workers in host countries. Fertilizer runoff can cause nutrient loading and damage to important waterways. Further, some of the pesticides most commonly used on coffee—organophosphates and carbamates—have been responsible for thousands of acute toxic poisonings, and have been linked to birth defects, cancer and Parkinson’s disease, according to the Natural Resources Defense Council (NRDC). These chemicals generally kill birds on contact, adding significantly to the assaults on avian species. Pacific Northwest-based coffee roaster Grounds for Change accuses chemicals used on coffee farms of "killing lakes and streams." Another advantage of shade-grown coffee, which should be of particular interest to coffee connoisseurs, is that the final product tends to be of higher quality. "Shade coffee is better tasting than full-sun coffee," points out Sabrina Vigilante, Rainforest Alliance’s marketing manager for sustainable agriculture. Llach says his family has grown a variety of arabica coffee known as bourbon, which cannot tolerate full sunlight, for 100 years. "Many growers have switched to smaller hybrids that produce more, but require more chemicals to grow and don’t taste as good. I’ve done a study of the coveted cup of excellence awards, and since 2000, 42 percent of all winners are bourbon. In Brazil, although less than two percent of the coffee is bourbon, 57 percent of the winners are," he says. In general, the two major types of coffee are robusta, which is sun-tolerant and pest-resistant and is grown on massive plantations—particularly in Indonesia, Vietnam, Brazil and India; and arabica, which is grown through much of Central America. Arabica has historically been prized for its mild, rich taste, whereas robusta tends to be much harsher (and higher in caffeine). "Robusta is generally cheap commodity coffee that goes into everyday mainstream brands and instant coffees, although it must usually be blended with arabica because it tastes terrible," says Vigilante. Currently, Brazil is working on genetically modified coffee in an attempt to increase the plant’s yields and hardiness, although a rollout is several years away. Research is also being done at the University of Hawaii. Resistance to the experimentation is substantial, particularly in Europe, where opponents cite environmental and social concerns. Field trials in French Guiana have been sabotaged. nt, and in Guatemala it’s probably 80 percent of the women." Such workers are at a severe disadvantage to understand the pervasive health threats posed by industrial chemicals. Of the 100 million people around the world who depend on coffee for their livelihoods, 25 million are farmers, and 70 percent of those people are trying to eke out a living from small plots of land. Between 1962 and 1989, the global coffee trade was managed essentially as a cartel under the International Coffee Agreement, which regulated transactions. At the same time that the agreement was disbanded, bumper crops of java and the entering of new players (notably Vietnam, driven by aggressive government policies) into the market led to a precipitous drop in prices. By 2001, the New York trading price for unroasted arabica coffee had sunk below 40 cents per pound. In contrast, through much of the 1970s and 1980s, the price was well over a dollar, and averaged $3.07 in 1977. In 1997 it averaged $1.66 a pound. As Gastronomica put it in 2003, "In real terms, prices are probably at their lowest point since coffee first became an internationally traded commodity some thousand years ago." However, according to Haven Bourque, a spokesperson for trade certifier TransFair, the average world cost of growing quality coffee is 80 cents per pound. Bollen says it costs 85 to 90 cents a pound to produce Guatemalan coffee and ship it to the U.S.
Not surprisingly, then, this price slump proved disastrous for many farmers of shade-grown beans. Unemployment rates skyrocketed from Ethiopia and Kenya to Latin America, hitting 80 percent in parts of Nicaragua and Guatemala. In 2001, Oxfam issued a statement saying unless the price paid to coffee farmers improved, it would "consign millions of poor coffee farmers and their families to extreme poverty, with devastating consequences for health, education and social stability." According to Rainforest Alliance’s Vigilante, "The impact on the environment is devastating during very low price years, because farmers are often forced to convert their land into cattle pastures or other destructive uses." This can include making ends meet by liquidating holdings into lumber or switching to sugar cane or plastic greenhouses for ornamental plants. The British Fairtrade Foundation estimated that by the end of 2001, some 1,000 of Colombia’s 560,000 coffee farms had begun cultivating coca or opium poppies out of desperation. "In Panama, I started crying when I heard from a Rainforest Alliance-certified farmer that his neighbor just converted his beautiful shade farm into a golf course," says Vigilante. "People assume coffee farmers are being taken care of, and then they wonder why South Americans are found dead in a van near the U.S. border or why desperate people would blow up our embassies," says Dean’s Bean’s Cycon. Coffee prices rose steadily through 2004 and the first months of 2005, and settled around $1.10 a pound during the middle of the year. While this is good for farmers, serious concerns remain. "Many coffee farmers have incurred substantial debt because of the price crisis, and it will carry over for many years," cautions Daniele Giovannucci, a senior consultant for the World Bank. "I think it is patently absurd to say the crisis is over," he says. "The true crisis is in the fact that coffee prices are so unstable, and that producers can’t plan for the future," argues Stephen Greene, a spokesperson for Oxfam America, which recently released a report calling on the U.S. government to take a leadership role in addressing coffee issues. "The U.S. just rejoined the International Coffee Organization, and it should take an active role by pushing for price stability," says Greene. "The U.S. has allocated money through USAID to help small-scale farmers, and what they need is access to commercial credit, technical assistance and information, participation in international debate and help with marketing. Coffee farmers tend to be very poor and marginalized, and they need help diversifying their incomes." 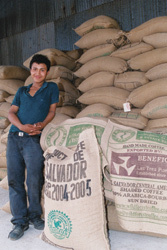 Other ways groups around the world are helping small coffee farmers and wage workers make ends meet, as well as improve their environmental sustainability, include varied certification programs, such as the organic and Fair Trade movements (see sidebar). "We have to look at the coffee market today, and ask ourselves what’s not sustainable," says Greene. "A lot of economists are promoting free trade, but a lot of the things going on in the coffee market are counter to free trade, such as the oligopoly of companies that control the industry. If the commodity market doesn’t work for the majority of producers, questions need to be asked." Since the collapse of the international coffee cartel, about half of the world’s coffee has been controlled by four corporations: Kraft (brands include Kenco and Maxwell House), Procter and Gamble (Folgers and Millstone), Sara Lee (specializes in the service sector, although retail lines include Chock full o"Nuts and Hill Bros.) and Nestle (the Swiss company’s Nescafé is the world’s number one java brand). Despite the hardships faced by coffee growers in recent years, these companies have earned robust profits. As Washington Monthly reported, "According to company documents, the Big Four’s coffee profit margins are as much as 25 percent—vastly higher than those for most other food products." The magazine concluded, "Prices for specialty blends at supermarkets and cafés have risen, and even the price of mainstream coffee brands like Folgers has not dropped that much. Call it Economics 102—a new paradigm in which both producers and consumers lose." "The recent increases in the price of green coffee have been more than increases in the price of retail coffee," argues Joseph F. DeRupo, director of communications for the National Coffee Association. "The entire industry supports sustainability at all levels," he says. "The coffee industry invests millions of dollars every year in sustainable production from feed to cup, including helping farmers with technical information, training and initiatives that encourage market development and price transparency. We help improve the lives of farmers with such projects as building schools, libraries and drinking water wells." Asked if full-sun production is as environmentally sustainable as shade grown, DeRupo responds, "No. Shade-grown coffee clearly promotes the kind of environment that leads to sustainability. Without shade trees you lose the natural flora and fauna that help preserve the land and viable production for years to come." "If we don’t take care of coffee-producing regions, it’s a south-to-north redistribution of wealth, and that’s just totally wrong," says Cycon. "I don’t think the big coffee companies are really moving in a sustainable direction. I think activists have forced them to pay attention, so you"ll see marketing dollars go to small projects that look good. But if you pay people a decent amount of money, they can build their own wells." 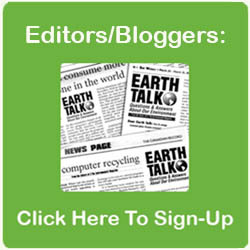 BRIAN C. HOWARD is managing editor of E.
Coffee and You: How Healthful is it? What Do All Those Labels Mean?